After realising she wanted to study bakery, Rebecca wanted to gain a degree and enjoy the university experience. She looked at her options online. "LSBU was the only university that offered the course which awarded a degree and I really wanted to go to university for the experience. Also experiencing living in London was an exciting prospect." Rebecca enjoyed her time at LSBU, gaining knowledge and a contagious passion for good bread. "The lecturers are passionate about their subject and they convey this in their lessons. Leslie Gadd in particular is good at engaging his students to learn and explore bread, giving us free range to create our own breads or try out recipes we find. It was a privilege to work with him." As part of her course, Rebecca went on placement at Dilly Daydream Cakes in Swansea, where she baked and decorated birthday and wedding cakes. "I learned how to structure the day's work so that the cakes could be as fresh as possible, while also giving me enough time to decorate them. I thoroughly enjoyed working there, especially when working on the elegant wedding cakes." "I remember one in particular, the first I had made at the placement entirely on my own. I was grinning from ear to ear when finishing it because I was so happy with what I had done and how closely it resembled the picture. The bride and groom actually sent the Dilly Daydream Cakes a huge bouquet of flowers as a thank you." 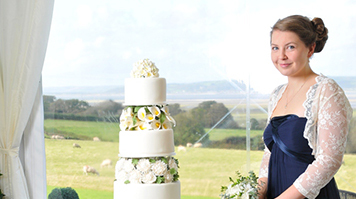 The placement and the course proved to be extremely useful to Rebecca, who by now had decided she wanted to launch a wedding and celebration cake business in South Wales, with the long term ambition of opening her own bakery, cake and coffee shop. With this in mind, she utilised LSBU's interest in enterprising students and was granted a place on our Entrepreneurship in Action Scheme – it allows current LSBU students to spend a year developing an enterprise idea of their own and they receive £500 of funding, a hot desk office space, mentoring, guidance and the opportunity to bid for further funding. Rebecca also entered LSBU's Make it Happen business plan competition for 2013, where she was runner-up – receiving £500, a one-year Institute of Directors membership, and 6 months of incubation space. By entering the competition, Rebecca was also partnered with a mentor who shared her excitement about the project and could help improve her plan. "LSBU has helped me significantly with my plans for the future. Being a member of the Entrepreneurship in Action Scheme has given me a great deal of teaching in the area of starting my own business and access to funding to aid the progression of my business. The Enterprise opportunities and lectures such as Start and Evolve have been wonderful advantages of studying at LSBU. It is nice to see that the university cares about what the students do and achieve once they have left the university and that they try to help as well as they can." Rebecca has continued to build her skills since leaving us, working with Sainsbury's to develop new products, and as a bakery manager, polishing her commercial sense in order to help her business grow. She has also travelled far and wide in search of new culinary experiences, working in Cairns, Australia and exploring the outback. "The plan for the business is to return to Britain in July and put my heart and soul into making it work by pulling all the knowledge I have learnt from my studies, travels and places of work to create a unique bakery business." Read more about how we inspire entrepreneurial students at LSBU.